Basic Sentences of Spoken Chinese(lower-intermediate) is a series of textbooks for oral Chinese, suitable for the Chinese language learners who have already learnt 5,00-8,00 words and mastered some everyday Chinese. The series contains two 12-lesson volumes, corresponding to the teaching periods of overseas universities. Each lesson is composed of three conversational texts, new words, notes on grammar, basic sentences, oral patterns, exercises and useful words and expressions. The texts completely simulate real life situations and mainly consist of short, practical sentences to carry on the elementary teaching of spoken Chinese. Of all the three texts in each lesson, one is devoted to the knowledge learnt before at the elementary stage, while the others show an increase in difficulty, making the learners feel familiar as well as fresh by observing the rules of learning. The “basic sentences” and “oral patterns” are all simple sentences and sentence patterns which are easy for the learners to memorize, simulate and speak out. In addition, based on the “intensive” idea of the Westerners in learning new words, “useful words and expressions” are provided at the end of each lesson, enabling the learners to say a wider range of things with the same sentence pattern. Upon finishing the series, one can grasp 2,000-3,000 Chinese words, make everyday conversations and express opinions on common topics. 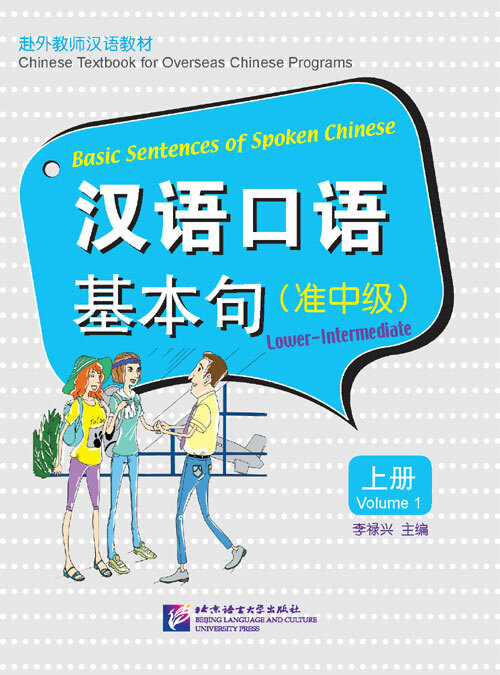 This is the first volume of the series Basic Sentences of Spoken Chinese(lower-intermediate), accompanied by an audio CD free of charge containing the recordings of the new words, texts and basic sentences in the book.